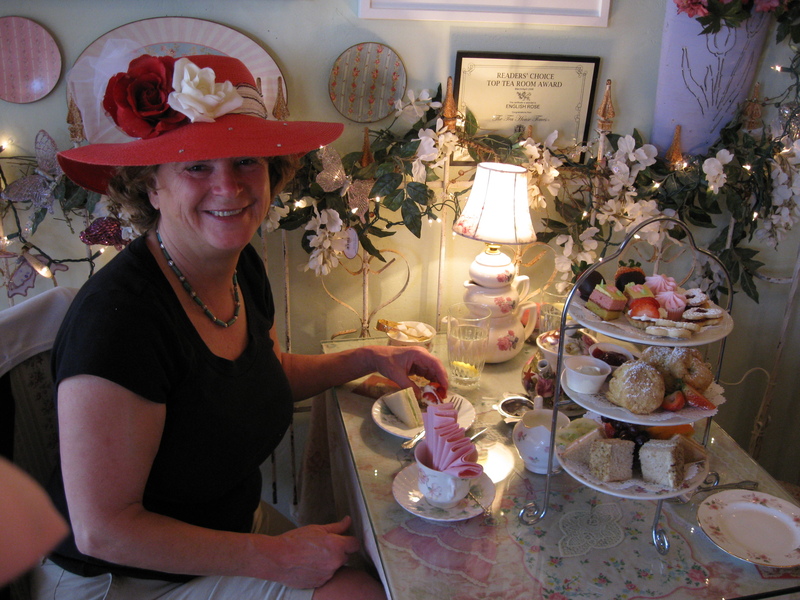 We had walked off the hot dusty streets of Care Free, Arizona and into a magical world created by our film star gorgeous host, Jo Gemmil, born of her real life experience growing up in English Tea Rooms. The environment that she created has not a spare inch of space that hasn’t been filled with Roses, bits of iron fence, small photos of English gardens, hundreds of unmatched floral tea pots, cups, creamers and sugar bowls which blossom into a wonderful collage of festivity. We were seated at a small table with iron cottage style garden chairs, and offered a tea list the likes of which I had never encountered. As we visually explored the small room, crowded with people doing the same thing we discovered the crowning achievement of this tiny jewel. 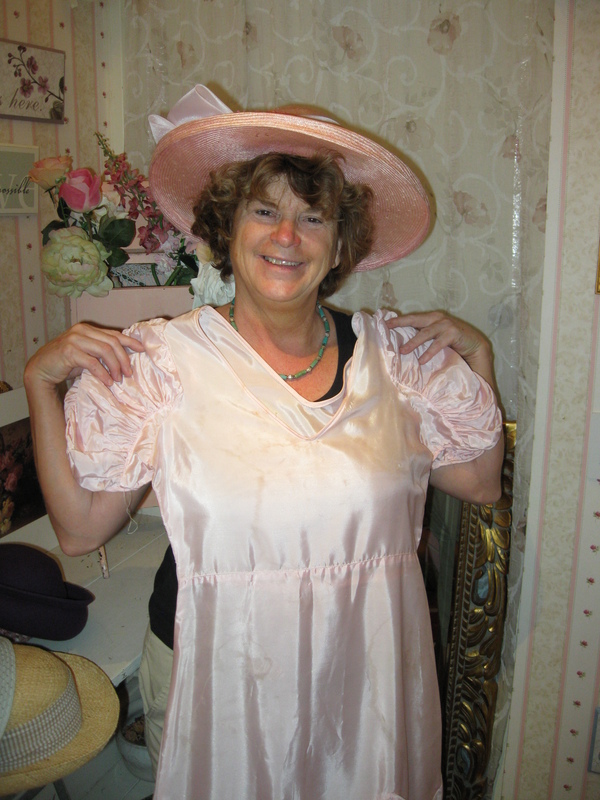 In the corner we discovered a white arch covered with roses that lead into a side room filled with garden hats of every description, and dresses with frills and lace. The urge to play dress up was beyond us. We instantly became ten year olds in granny’s closet. Uplifted spirits guaranteed. 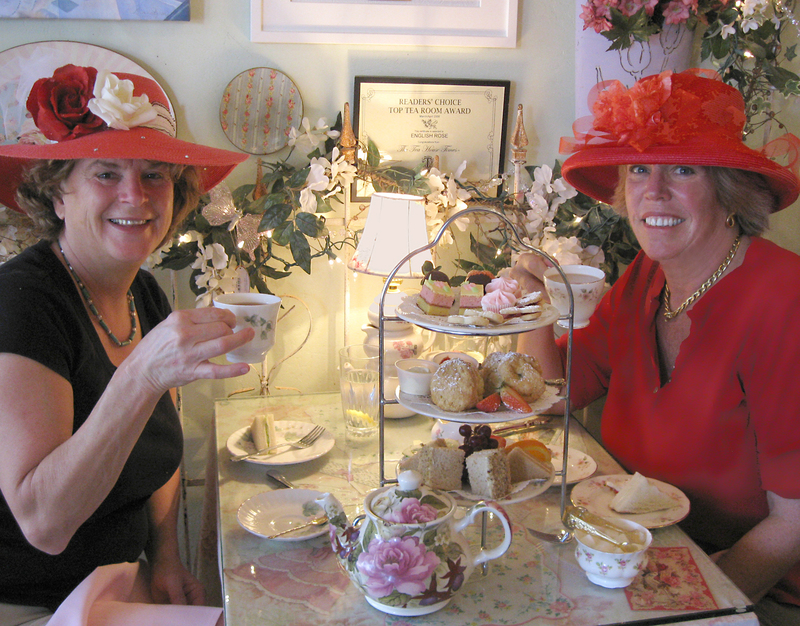 Over a flowered bone china tea cup my eyes picked up my friend in her red wide brim hat with red and white roses, sprinkled with diamonds around the brim no less. It was impossible not to smile. Here we were, old friends having tea and biscuits with Devonshire cream, strawberries, cucumber tea sandwiches along with every kind of diet violation on tiered plates. Before long everyone in the room had made a selection from the joyous collection of hats and was happily probing the tiered plates for treats. 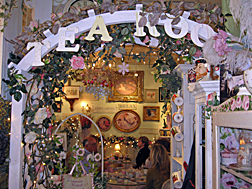 The teas were wonderful, the goodies delicious and the atmosphere something that is good for your soul.